Macromedia Dreamweaver is a web development tool. Dreamweaver is used to create and manage web pages and sites. Regular Dreamweaver backup is needed for keeping your Dreamweaver data safe and secure. 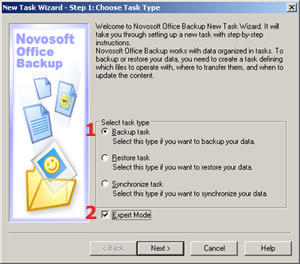 How to do Dreamweaver backup? add the required Dreamweaver files and folders to the backup set. By default the files created by yourself are stored in My Documents folder. 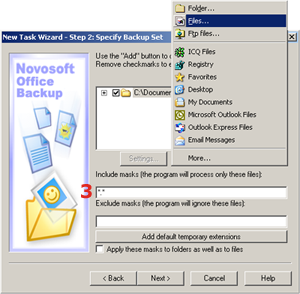 With Novosoft Office Backup you can back up My Documents folder automatically. 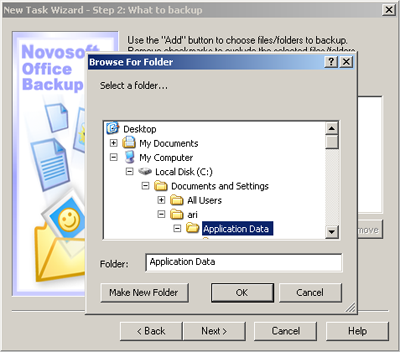 You can also specify Dremweaver file extensions in Step 2 of the New Task Wizard: What to back up (Expert Mode) and Novosoft Office Backup will find and backup all files automatically. Dreamweaver file extensions are *.htm,*.html,*.dwt,*.js,*.css, etc.